Once Miles was done participating in the requisite crossover fights, we’d never quite get back to the interrupted story. 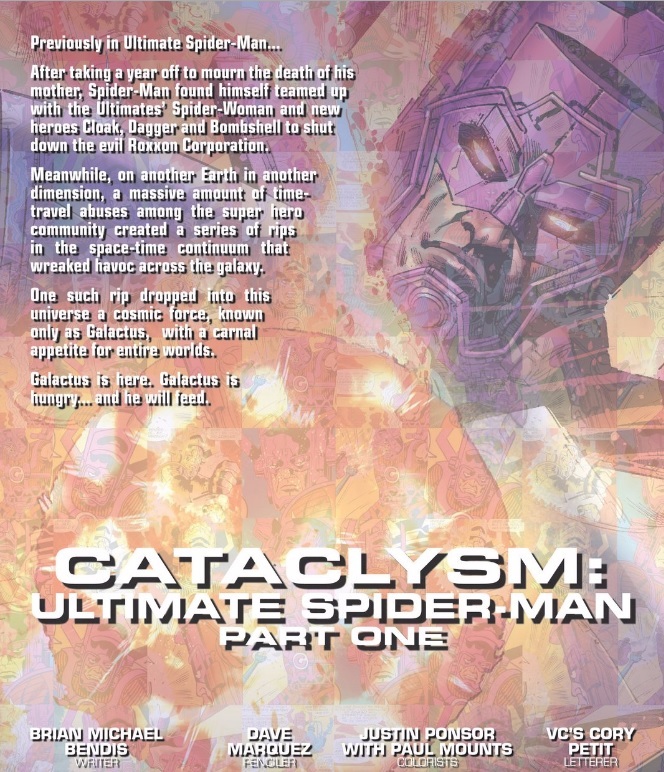 So interesting ideas surrounding the loss of Uncle Aaron, his new friendship with the Ultimates, and even discovering his girlfriend’s secret life just faded away or were otherwise quickly wrapped up. That’s why I was wary of seeing a big “CIVIL WAR II” logo slapped on an otherwise striking and intense cover by Sara Pichelli. Having really enjoyed this volume’s attempt to flesh Miles out as a character and take on questions about race and identity, I was nervous about sidelining everything for another punch-em-up. I’m happy to say that history hasn’t repeated itself and that we’re instead treated to a fantastic character-driven chapter. The crossover is handled in a way that actually fits the story we’ve been reading instead of forcing awkward plot gymnastics. 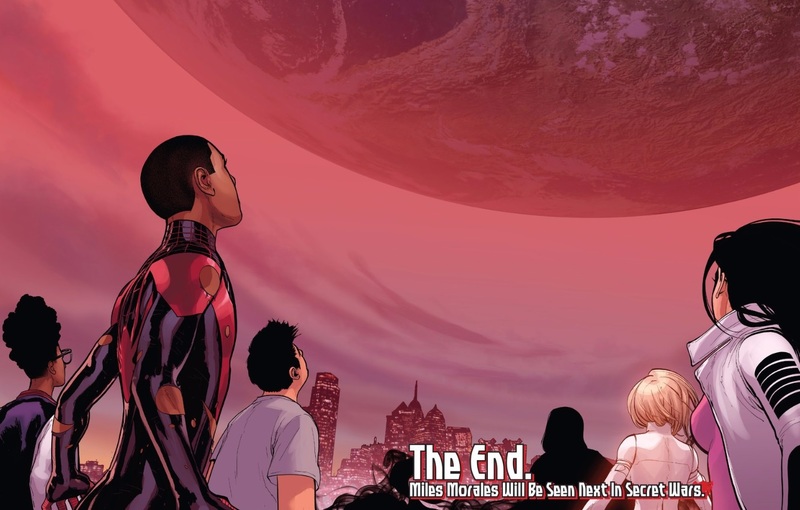 I felt that Bendis managed to weave the premise of “Civil War II” into Miles’ story in a truthful and thought-provoking way. Bendis has Tony Stark present his side of the main conflict to Miles (as well as readers who may not be following the main event). This scene could have been dismissed as basic exposition, but Bendis has Miles draw the parallel between Carol Danvers’ approach and racial profiling, further building upon ideas that he’s seeded over the past few issues. Race has been a factor in this volume, but more importantly, it’s been central to our national conversation for some time (and not in a great way). These are important ideas and presented in a way that I felt could be particularly accessible to younger readers. And speaking of younger readers – as a dad, I really appreciated seeing Miles turn to Jefferson to try and process the conversation. I’ve viewed their relationship as the most developed over the years and it’s great to see that Spider-Gwen isn’t the only Spider-character than enjoys a trusting and affection bond with their old man. Trust is a key theme in this series, especially seeing as it’s been broken left and right. While Miles forgave Ganke for revealing his secret, the situation between Miles’s parents and Gloria is escalating in an intriguing way. We see this echoed in our own world; we say that we want to think the best of others, and yet it can be so easy to sow (and get caught up in) suspicion. Then there’s Jefferson’s past becoming his present. His intentions are good, but is he being a hypocrite in encouraging Miles to tell his mom and grandmother the truth? I’m especially eager to see where these threads lead. Sara Pichelli and Justin Ponsor left big shoes for artist Nico Leon and colorist Marte Gracia to fill. Leon’s style picks up fairly seamlessly from Pichelli, with characters’ angular features and expressive acting, beautiful backgrounds, and fun details to discover. I loved Leon’s choice to make Spider-Man’s eyes expressive, particularly his squint at Iron Man (is this the first time it’s been done in the main series for this character?). I had some minor issues, namely some awkward-looking musculature for Spider-Man in the panel before he encounters Tony (an otherwise dynamic frame with multiple Spideys) and feeling like certain characters looked a little too similar – e.g., Ganke and Fabio, and then Rio and Jessica. Gracia’s coloring helped distinguish the characters, and his work for the outdoor scenes stand out as particularly moody and beautiful. 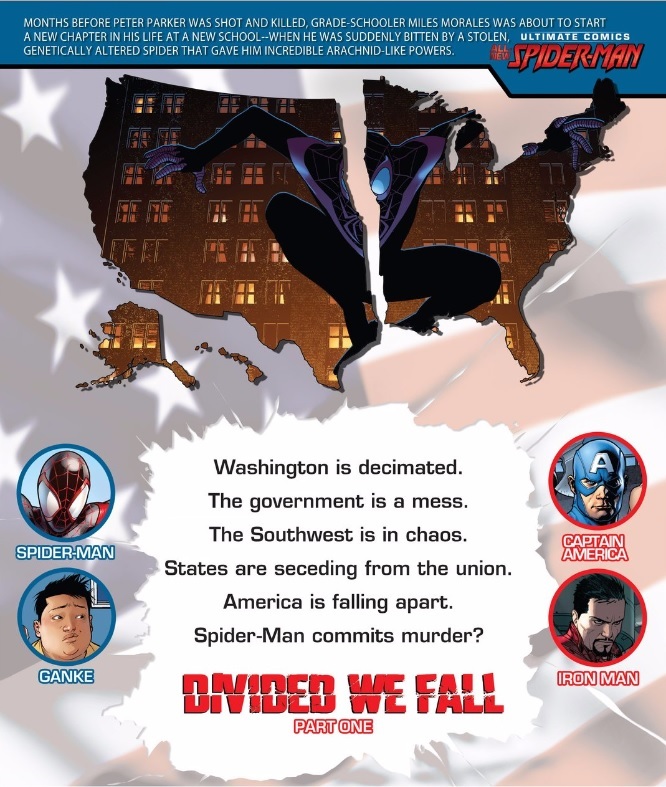 Rather than derail things, "Civil War II" offers a way to build upon the series, its characters, and the ideas of race, honesty, and trust that it’s been steadily exploring. Big ideas, but handled in a way that respects Miles fans of all ages.